Try this delicious low fat beef stroganoff version of the celebrated dish. This is considered a comfort food in our family without all the calorie guilt. Beef Stroganoff was created in the 1890s by chef Charles Briere for Count Paul Stroganoff, a 19th century Russian diplomat, who was in a friendly competition with the chefs of other families in St. Petersburg, the cultural center of Russian society. The Stroganoff’s chef won the prize with his recipe. Another version is that Count Pavel Stroganov, a celebrity in turn-of-the-century St. Petersburg, was a noted gourmet as well as a friend of Alexander III. He is frequently credited with creating Beef Stroganoff or having a chef who did so. The name of this dish comes from Russian Count Grigory Stroganove (1770-1857) who was one of the richest noblemen and held the highest diplomatic posts. Great gourmet, he loved delicious dishes and always had the best cooks. One of them invented an original dish from scraped meat and it was on the Count’s taste. The dish took the name Stroganoff, but, as to the cook, his name was unfairly forgotten but some people told (“bitter tongues”) that the dish was made especially for the Count when he, being old, lost all his teeth and could not chew a simple beef steak. 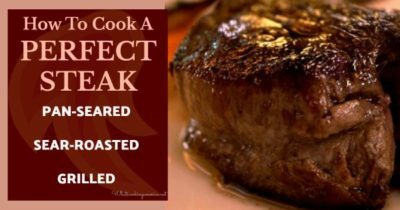 Check out all of Linda’s Beef Recipes (using various cuts of beef) and Pasta Recipes. * Pasta Hints and Tips (Learn how to cook pasta, etiquette of eating pasta, history of pasta, and much more). ** I have substituted lean ground beef (hamburger) in place of the steak. My family loves it both ways. Cook egg noodles according to package directions; drain and return to pan to keep warm. Cut meat into thin strips, about 1/3-inch by 2-inches long. In a large frying pan over medium-high heat, heat olive oil. Add steak strips and sautuntil medium-rare; transfer onto a warm platter; cover loosely with aluminum foil to keep warm. Reduce heat to low, add onion and garlic; sautuntil soft. Stir in mushroom soup, mushrooms, tarragon, Worcestershire sauce, salt, and pepper; simmer until mushrooms are cooked. Add sour cream and the steak strips; stir until well blended. Remove from heat and serve over cooked noodles.